Neptune is the outermost planet of the gas giants. It has an equatorial diameter of 49,500 kilometers (30,760 miles). If Neptune were hollow, it could contain nearly 60 Earths. Neptune orbits the Sun every 165 years. It has eight moons, six of which were found by Voyager. A day on Neptune is 16 hours and 6.7 minutes. Neptune was discovered on September 23, 1846 by Johann Gottfried Galle, of the Berlin Observatory, and Louis d'Arrest, an astronomy student, through mathematical predictions made by Urbain Jean Joseph Le Verrier. The first two thirds of Neptune is composed of a mixture of molten rock, water, liquid ammonia and methane. The outer third is a mixture of heated gases comprised of hydrogen, helium, water and methane. 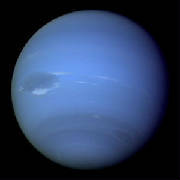 Methane gives Neptune its blue cloud color. Neptune is a dynamic planet with several large, dark spots reminiscent of Jupiter's hurricane-like storms. The largest spot, known as the Great Dark Spot, is about the size of the earth and is similar to the Great Red Spot on Jupiter. Voyager revealed a small, irregularly shaped, eastward-moving cloud scooting around Neptune every 16 hours or so. This scooter as it has been dubbed could be a plume rising above a deeper cloud deck. Long bright clouds, similar to cirrus clouds on Earth, were seen high in Neptune's atmosphere. At low northern latitudes, Voyager captured images of cloud streaks casting their shadows on cloud decks below. The strongest winds on any planet were measured on Neptune. Most of the winds there blow westward, opposite to the rotation of the planet. Near the Great Dark Spot, winds blow up to 2,000 kilometers (1,200 miles) an hour. Neptune has a set of four rings which are narrow and very faint. The rings are made up of dust particles thought to have been made by tiny meteorites smashing into Neptune's moons. From ground based telescopes the rings appear to be arcs but from Voyager 2 the arcs turned out to be bright spots or clumps in the ring system. The exact cause of the bright clumps is unknown. The magnetic field of Neptune, like that of Uranus, is highly tilted at 47 degrees from the rotation axis and offset at least 0.55 radii (about 13,500 kilometers or 8,500 miles) from the physical center. Comparing the magnetic fields of the two planets, scientists think the extreme orientation may be characteristic of flows in the interior of the planet and not the result of that planet's sideways orientation or of any possible field reversals at either planet. This mosaic combines an almost true-color picture of Neptune taken by the Hubble Space Telescope's (HST) Wide Field Planetary Camera (WFPC), with a picture of Triton taken with the HST's Faint Object Camera. Although faint, the image of Triton vaguely shows a brighter equatorial region. The south pole is to the lower left. These almost true-color pictures of Neptune were constructed from HST/WFPC2 images taken in blue (467-nm), green (588-nm), and red (673-nm) spectral filters. There is a bright cloud feature at the south pole, near the bottom right of the image. Bright cloud bands can be seen at 30S and 60S latitude. The northern hemisphere also includes a bright cloud band centered near 30° N latitude. The second picture was compiled from images taken after the planet had rotated about 180 degrees of longitude (about 9 hours later) to show the opposite hemisphere. One feature that is conspicuous by its absence is the storm system known as the Great Dark Spot. The second smaller dark spot, DS2, that was seen during the Voyager-2 encounter was also missing. The absence of these dark spots was one of the biggest surprises of this program. These dramatic changes in the large-scale storm systems and planet-encircling clouds bands on Neptune are not yet completely understood, but they emphasize the dynamic nature of this planet's atmosphere, and the need for further monitoring. These three images were taken on October 10, October 18 and November 2, 1994, when Neptune was 4.5 billion kilometers from Earth. Building on Voyager's initial discoveries, Hubble has revealed that Neptune has a remarkably dynamic atmosphere that changes over just a few days. The temperature difference between Neptune's strong internal heat source and its frigid cloud tops (-162° Celcius or -260° Fahrenheit) might trigger instabilities in the atmosphere that drive these large-scale weather changes. The pink features are high-altitude methane ice crystal clouds. In June 1994, the Hubble telescope revealed that the Great Dark Spot found by Voyager 2 was missing. This new image taken on November 2, shows that a new spot near the limb of the planet has formed. Like its predecessor, the new spot has high altitude clouds along its edge, caused by gasses that have been pushed to higher altitudes where they cool to form methane ice crystal clouds. The dark spot may be a zone of clear gas that is a window to a cloud deck lower in the atmosphere.